In this episode, Jeff Corwin takes viewers deep into the jungle to search for some of the most elusive denizens of this wild land. Jeff´s first encounter is almost his last- when he is charged by a herd of wild Asian elephants. Next, Jeff journeys to a wildlife area called Sepilok, which houses an ambitious program to return former captive orangutans to the wild. Here, Jeff meets orphaned infants, adolescents who are learning to be wild and even an adult that is living on his own. Jeff then moves on to explore the major river of this region of eastern Borneo and finds the reclusive proboscis monkey. Along the way, Jeff has a very personal encounter with a tiger leech and then a mangrove snake. Next, Jeff takes viewers to a mammoth cave that is home to millions of creatures: bats, swiftlets, cockroaches and beetles. Finally, Jeff reaches the fabled Snake Island; a small rocky spit of land that is home to hundreds, if not thousands of deadly venemous yellow-lipped sea kraits. 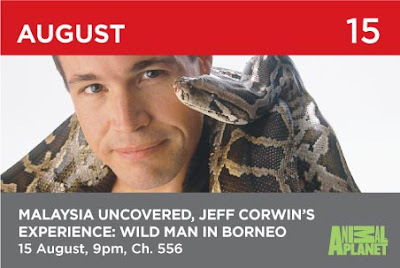 Watched this program just now @ Animal Planet channel... 1st thing that i impressed is, woaahhh... all the place that he (Jeff Corwin) goes are in Sabah, Malaysian, Borneo. Started with Tabin Wildlife, where he met with the largest animal in Borneo, the Borneo Pygmy Elephant (the smallest elephant in the world). Then he go to Sepilok Orang Utan Rehabilitation Centre located at Sandakan to meet the endangered spescies the Orang Utan. The journey continue to Kinabatangan River (Sabah's Longest River) to see the Proboscis Monkey and it only can found in Borneo (especially Sabah!). After that he go to Bakungan Island (If im not mistaken) to watch the sea turtles hatched at night and he said that was the unforgetable experience. He also helped the Sabah Park Officer to release the baby turtle back into sea. Last but not least, he traveled to Pulau Tiga (or well-known as Survivor Island) to see the sea snakes. as he said the sea snake spent 90% of their life on the sea...!! that why their got different tail with flipper.